Apparently after our last meeting the vicar was on his hands and knees picking up pins so we were very careful to make sure we left no traces of ourselves after the September meeting of Chi Stitch! There were fifteen of us last night and once again the hall was a hive of activity! The buzz of conversation really is uplifting – I felt I wanted to record it! I’m always amazed at how much gets done in spite of all the chatting and tea drinking and how organised some people are in preparing for the evening. 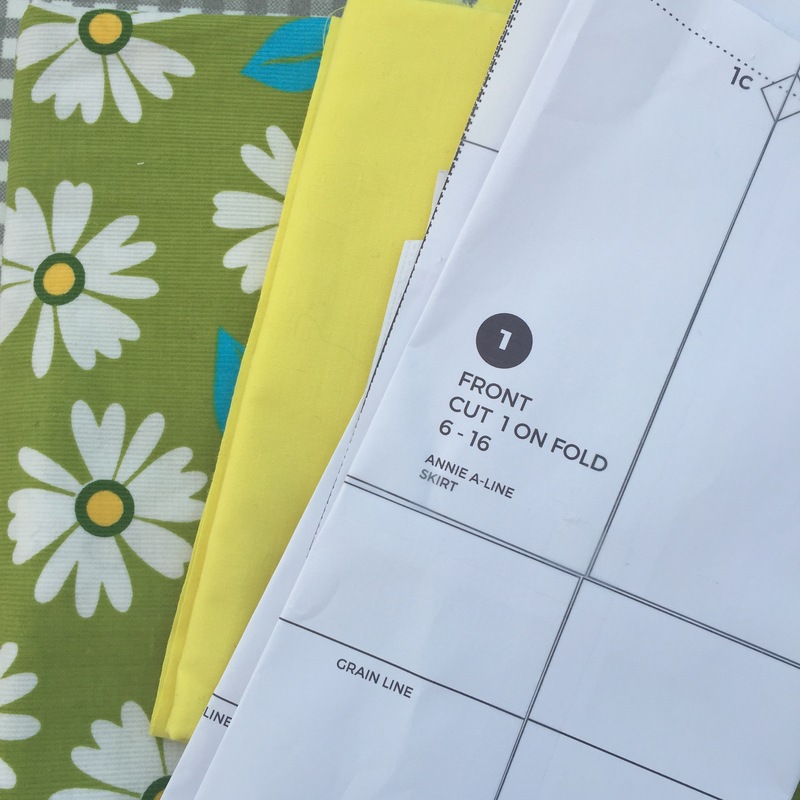 My preparation mostly consists of folding up the fabric neatly in the swap basket and checking through the swap patterns in case I missed something I might like left over from last time! As a result I acquired this jersey skirt pattern. It will probably be stored away until next summer but I love the striped version. I added some fabric to the basket from my stash. I really love it when other people decide it is just what they want and it heads off to a good home. I also bake! I forgot to take a picture of this month’s cake selection. There were chocolate and pecan flapjacks, carrot muffins and salted caramel cookies. We also provide a takeaway cake service! Onto the sewing. Here’s some photographs from the evening. The swap baskets had ended up on the floor because we’d used up all the tables! That embroidery was exquisite and I’ve acquired some of that striped fabric from @vintage_charity for another Cleo. We just need to make sure we don’t wear our dresses at the same time! She also gave me some jersey fabric for making t-shirts for Baby J and a piece of vintage curtain fabric which I shall use for a dress. I think I came away with more than I’d donated! I’d decided not to take my sewing machine this time and spent the evening pinning a pattern. I’m helping Karen out on her stand at the GBSB Live on Thursday next week and I’ve volunteered to sew up one of her samples. No pressure! I’m making the Trapeze Dress in a Robert Kaufman Essex Linen. I’m going for the short sleeves and I think it’s going to be lovely. I’ve mentioned before that I’ve been making a special Cleo for the event and she’s now finished apart from securing the straps. I just want to try it on once more to make sure I’ve got them at the right length. I’ll be writing a separate post on this dress but here’s a picture in advance. The next meeting of Chi Stitch will be on Wednesday 11 October at St George’s Church Hall, Cleveland Road, Chichester. 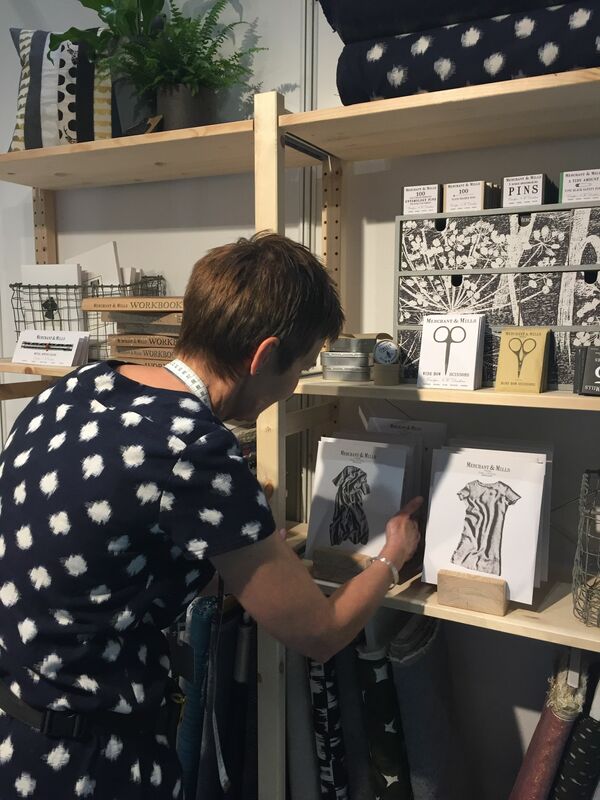 We’ll also be running a one day print workshop with Miesje Chafer on 28 October at the same venue. Check out Miesje’s website here to see her work. The day will give you a chance to design and print your own two-colour repeat design which I’m very excited about! Places are limited to eight so if you are interested leave a comment below or DM me on IG – @janemakes – for more details. Although I wear jeans (usually from a charity shop) at the weekend and at home I don’t make trousers and never wear them to work. Not only am I short but I have VERY short legs and I think I look more in proportion when I wear skirts and dresses. I have a number of favourite skirt patterns but my most used is probably the Annie A-Line Skirt pattern from Sew This Pattern and is #3 in my Desert Island Patterns list. I don’t really have the patience for complicated pdfs but this one is very quick to assemble and has the added bonus of being FREE! Thank you Annie. The instructions are excellent with lots of clear photographs and this would be the perfect pattern for a beginner. One of my main reasons for liking it – and using it so much – is that it’s a great vehicle for a bold fabric! I also really like the bias bound finish on the waistband facing which gives a lovely neat edge. Unless a waistband is wide I find skirts with facings far more comfortable if I’m sitting at my desk all day. 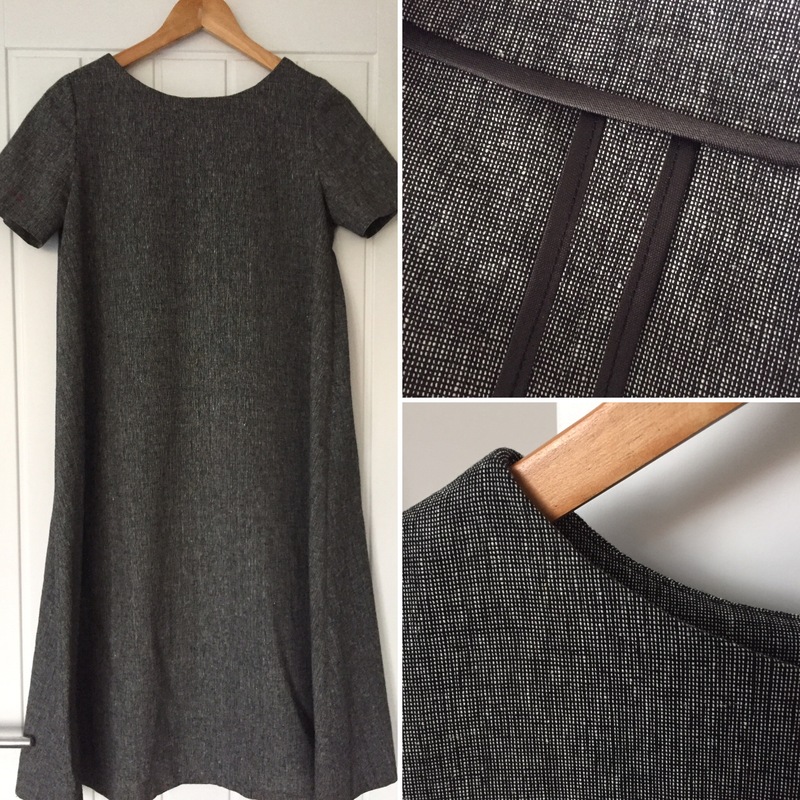 I’m not sure there’s much more I can say about this pattern as it’s such a simple one but it’s well worth a try if you’re looking for a straightforward and very useful A-Line Skirt pattern which doesn’t use much fabric. It doesn’t require much sewing time either so it’s a great opportunity to focus on a neat finish. Annie has some other lovely patterns to try. The Daphne Day Dress would make a nice party frock. I wasn’t keen on the open back version but she has now added a pattern extension to fill in the gap. Here’s a selection of the A-line skirt versions I’ve made so far. I usually add a lining, although the stripe is the reverse of a denim from Cloth Kits. The yellow and blue floral was a length of African print fabric I bought from Tinsmiths. These are worth looking at as they work out at around £5 a metre. I shared mine with two other people as I really didn’t need 5 metres! The rest of the fabrics are curtain remnants from C & H Fabrics. I currently have one more Annie lined up to make with some fine needlecord but there will definitely be more. It was going to have a yellow cotton lining but as it’s now going to be worn in the cooler weather I will line it with something more slippery so it doesn’t catch on my tights. Talking of tights … I succumbed to wearing them yesterday and I’ll be heading over to Gypsy Tights soon to order a new supply. This is not a sponsored post – I just think they have a great selection! I’m very tempted by some of the colours – especially Fig, Cyclamen and Gunmetal. I also want the Warm Mustard ones but last time I bought Mustard tights I felt they made my legs look a bit like they were recovering from a bad bruise! Stay tuned for further Desert Island Patterns!